A power washing business, even though it might seem like as safe as any other field of work, actually brings with it a complex environment full of risks of a different nature. A business which provides services in the area of power washing can be set up relatively easily in terms of training and equipment. 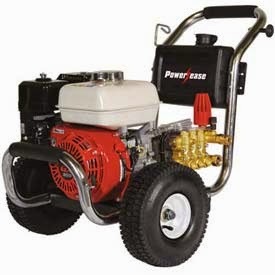 The key component of any power washing business is the machinery which produces the high-pressure flow of water. The high-pressure H2O stream is the basic element in this heavy-duty cleaning process. In the power washing industry, these machines, along with the broader hazardous work environment, make pressure washing an extremely risky business in every sense of the word. Here are the exact reasons which make it so problematic and dangerous to all involved. 1. A power washing business is more likely to cause damage to a property than any other services oriented company available to the general public or commercially. In fact, it produces more damage than all other services combined. An average power washing business produces more damage than any plumbing, roofing, painting, electrical, carpentry or lawn maintenance business. What? Yes, it's a fact. It is easy to see how this immediately results in more expenses to anyone's company in that line of work. 2. A power washing business exposes their staff (and customers) to many physically hazardous items. It includes a constant presence of machines that have moving parts, heat, harmful water pressure, working surfaces that are slippery, and an exceedingly noisy environment. 3. Furthermore, elements such as chemicals, soaps or detergents, sanitizing solutions, and degreasers, all of which are proven to have adverse effects on the human body, may be present. This is the reason why Material Safety Data Sheet (MSDS) should be explicitly reviewed and understood by all those who are on a power washing job site. Any business in this line of work should be prepared with their contractor liability insurance and should be ready to provide proof of that and other insurance. Their insurance should cover any property damage or bodily injury that the same company caused accidentally to the customers, their family members, employees (in the case of a commercial location) or the very property on which the work is being completed. The same power washing business should also cover workman’s compensation that provides funds for injuries that the contractors produce on themselves or on their employees. Some states do not require contractor business below a certain size to have Worker's Comp, but in any case, a policy certificate may be demanded from any contractor before work begins. Finally, any accident that involves the contractor equipment should be thoroughly examined and documented, because in a case of an accident, the contractor might claim that the client’s faulty equipment (for example, a customer’s ladder from which a contractor fell) lead to their injury. Such situations can result in an insurance clash and a long and bitter lawsuit battle. This is the reason why no one should provide their contractor with anything. Contractors should provide everything including tools and machinery. Thanks to these facts about power washing business, it is easy to see why the same field of business is considered so dangerous and risky. Each item above can be costly to a business. Speaking of costly. What about the expense of the equipment in the first place. Your power washer is expensive outdoor power equipment. When power washers fail, should you just replace 'em? No! Why would you? Small engine repairs are easy and small engine parts are readily available here. It is way more cost effective to repair than replace. Probably faster too. Repair small engines, and be back on the job faster, so you lose less money. Thank you for altering me to the fact that I need a license to start a pressure washing business. I was going to start mine without one. After reading your article, I think I’ll take care of the issue before taking things further. I don't think that license are required everywhere it depends on your location. However as a homeowner you should always want the credentials or possible a confirmation of insurance before they get to cleaning your house. Good observation Domonick. Thanks for contributing.